Living in Scotland is a fortunate thing when special events and releases are announced. Whisky is a worldwide event nowadays with tasting sessions, experiences and releases almost on a weekly if not daily basis – there is always something happening. This is especially so if you live in the home of whisky. 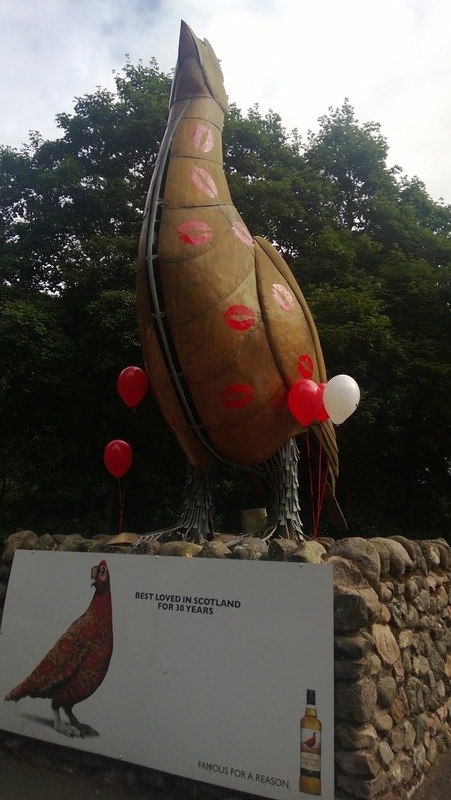 As part of the Famous Grouse 108th birthday celebrations, the home of the blend was having a series of events and throwing its doors open to the public. Now yes, the Grouse is a blend and arguably the most of famous of all and as such it is a composite of several distilleries. It’s true historical home is Perth and this is why the current owners revamped the Glenturret distillery to become it’s surrogate homeland, as it is the nearest distillery they have being just outside Crieff. I did the Glenturret tour yesterday and I’ll go over that in another update however for now it’s all about the blending session with Master Blender Gordon Motion. A lovely morning greeted us as we arrived at this small, picturesque distillery which was being decked out with balloons and a celebration coat. The events included a science festival to entertain the youngsters and I must mention the cooper display. Seeing a cooper at work is an impressive sight and strangely addictive after our experiences at the Speyside Cooperage where are you free to see for as long as you wish in the viewing platform. Power, accuracy and speed are key ingredients and skills to harness the cask. There was the opportunity to try yourself but I kindly passed especially after running through some of the injuries a cooper can experience during their career! If you have the chance to see these guys in action then do take it and we enjoyed an informative chat yesterday which shed some light on the apprenticeship and the demands of the role. Before the Master Blending session I did taste the Ginger Grouse which in the sunshine and accompanied by some ice and lime was far too drinkable. I could quite see myself enjoying a couple of these as a precursor to a dram later on. Some may view it as sacrilege however as long as you enjoy your whisky is the most important thing. 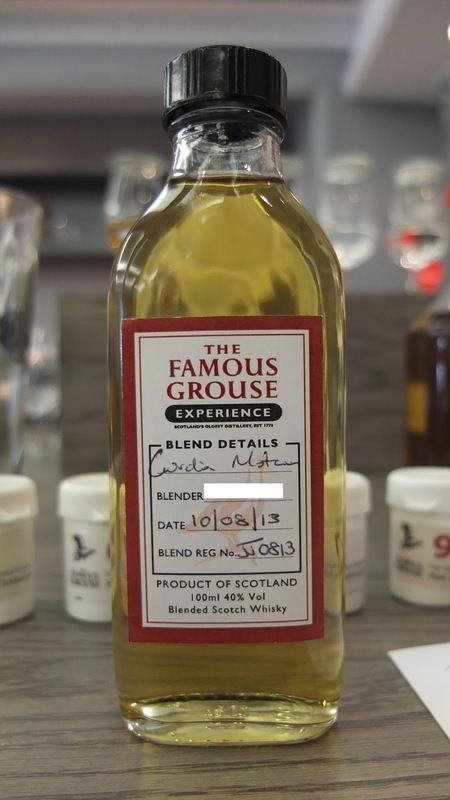 And certainly the Grouse blend is pushing new boundaries with it’s range. Growing up in Scotland, I always associated it with the national rugby team and it’s robust presentation as a historical malt that remained faithful to its heritage. Now in addition we have the Snow, Black, Naked and the Black Grouse Alpha Editions. As part of the celebrations Master Blend Gordon Motion was at the distillery for the weekend which did seem to cause some excitement amongst the staff – all of whom are proud of the Grouse blend but also the overlooked Glenturret single malt. The sampling room at the distillery was only finished the day before and this was it’s debut to the public. No expense has been spared and the imagery, marketing and layout all fit in well with the interactive grouse experience throughout the site. An initial free session with Gordon commenced with a short presentation about whisky and the process itself before we were able to nose new make spirit and pieces of casks to awaken our senses. The new make trio were North British, Glenturret and of particular interest the new Glenturret peated spirit Ruh Dhour (I’m sure I’ve spelt that wrong), however this spirit is a new journey for the distillery and will assist the Grouse range in the future. It is a very pungent and robust Islay aroma; a total opposite to the delicate and gentle spirit Glenturret has produced until now. I’ll certainly be keeping an eye on where this experiment is intended to finish. After an interesting Q&A session with Gordon about his dream job (which it is), a fortunate few remained in the room for the hands on £30 blending session. Now I have had a similar experience before at Glengoyne distillery and it is good fun. Being able to make your own tailored blend from a variety of samples with a grain base (around 60% is best), to deliver your own 100ml unique edition is a pleasure. Before we got stuck into the creation a sensory nosing test was provided with 10 numbered pots laid out in front of us – the challenge to identify the aromas. Gordon explained that this formed the initial stage of his job application with around 5 pots to test his ability to identify smells, before moving onto more difficult nosing tests and the dreaded interviews. I must say since enjoying whisky and also cooking, my appreciation and identification of smells has improved greatly. Gordon suggested that while we may recognise a smell; it is often the case we cannot put it specifically down onto paper. So instead, write what we associate that smell with, whether it is childhood memory or a certain place. So how did I do? I was pleasantly surprised to be honest as out of the 10 I was bang on with 7 and in the realms of the other 3. One was coconut which is such a delicate smell and I did pick up on the tropical aspect going with banana. There was one pot that I just couldn’t nail down specifically and went with furniture polish/cleaning products and this turned out to be lemon. Now how didn’t I identify lemon? Then Gordon explained the citrus element of so many cleaning products nowadays is just that, rather than chemicals from bygone eras. So not complete madness on my part! After the nosing test we then used these answers on a grid chart to outline the type of blend we wanted to create. The characteristics of the Famous Grouse, Highland Park 12 year, Macallan 10 year and Glenturret 10 year were provided as examples. My own aim was to create a light, summery blend that would fit in well with the warm weather we had been experiencing of late. Inbetween this creation process Gordon commented on our initial attempts and was very open to questions. 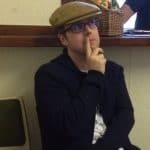 I found it very interesting the different flavour profiles that specific areas of the world request and what the marketing bods approach him with. This man is responsible for the Grouse and the creation of the Naked, Black and Black Alpha – which has just been released. So the £30 fee was worth it along for this opportunity and hopefully more will take up the blending sessions today with Gordon. Sadly, he wasn’t giving out the recipe for the Grouse! It was very revealing to gauge his thoughts on no age statement whisky given that the Macallan is within the Grouse group. And his answer? Well, it is all about the quality of the cask not the age. You could have spirit in a steel drum for 20 years and gain nothing from it. Having access to thousands of samples he has experience of younger whiskies in better casks that outperform much older cousins. And this did make sense to me and made for a strong argument particularly when I think of older whiskies I have experienced that offer very little. Why am I thinking about Littlemill here again?? Amidst all of this I did forget to ask about the Black Diamond single malt blend which does have an interesting genesis and comes from Gordon; oh well maybe next time. Then after all that our 100ml blends were signed by Gordon and our certificates as well, which rounded off a fun session. I found my blend to be very enjoyable as you do have to make a touch over 100ml to ensure a little tasting before bottling. The bottle itself will remain sealed for a nice keepsake of a very enjoyable morning. The distillery tour of Glenturret will follow later along with tasting notes for the newly released Black Grouse Alpha Edition which I picked up from the well stocked distillery shop. I also walked away with the mysterious Black Diamond blend so I have plenty of potential material for whiskyrover. Today I have to force myself along to the sold-out Whisky Fringe 2013, so this will come first later this week. Certainly, for all its rain, living in Scotland does have its own unique benefits.